DENVER, CO / ACCESSWIRE / September 13, 2017 / Des Hague, Co-Founder and CEO of Hague Enterprises, announced today the US launch of JADA's Vegan Certified, all-purpose Chicken Salt seasoning. Hague Enterprises (www.hagueenterprises.com) is a Colorado-based investment and advisory firm. "Chicken Salt is Australia's #1 All-Purpose Seasoning and JADA's non-GMO, Vegan Chicken Salt is already outselling the online competition in this country," said Hague and continued, "It's a versatile spice blend that is truly flavorful and an excellent addition to every pantry." "We are very proud of our vision. We simply want to inspire more home-cooked meals with healthy ingredients and spices. We are very excited to work with Des, the Hague Enterprises team and their passion to share our vision with every family in America," said JADA Spices. JADA's Chicken Salt, made from unprocessed and unrefined sea salt, onion, and garlic powder, as well as Turmeric and other spices, is the only Vegan Chicken Salt produced in America. It is a healthier alternative to table salt and chicken bouillon without MSG, soy, additives, or fillers and without allergens, including milk, eggs, or fish. Inspired by Australia's non-vegan Chicken Salt, JADA Spices proves that Vegan alternatives offer a much healthier option for health-conscious consumers without sacrificing taste. "I, along with Hague Enterprises, have already discussed many ideas on how to creatively educate the public about Vegan Chicken Salt's healthier and flavorful benefits," stated Hague. "We look forward to working with JADA Spices, and their experience with the Vegan market will be essential to the continued growth we expect to see. 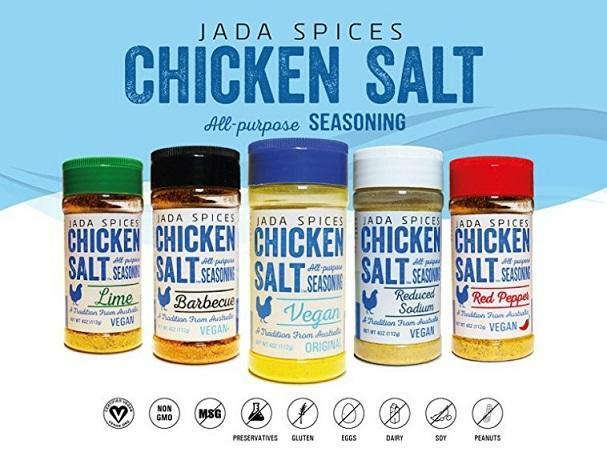 Our goal is for JADA's Vegan Chicken Salt to become a staple in everyone's kitchens across America," concluded Hague. "Even if folks choose to use our seasoning for non-vegan dishes, opting for healthier spices is an effort worth making," added JADA Spices. JADA Spices LLC is a US-based company serving the local and national market, with a vision for a delicious blend of tasty homemade spices and herbs. JADA'S Vegan Chicken Salt has been featured on Valerie Bertinelli's "Valerie's Home Cooking" on the Food Network and earned Amazon's Best-Seller title on a few occasions. Currently, they are proud to offer six Vegan flavors: Original, Low Sodium, Lime, Red Pepper, BBQ, and Turmeric Salt. For more information, visit: https://www.chickensalt.com/. Hague Enterprises, LLC. is a Colorado-based advisory and investment company focused on multiple sectors. The firm provides business advisory services, expansion, start-up and turn-around venture capital investment opportunities, executive mentorship, consulting and leadership development programs led by the firm's preeminent business thought leaders.